I recently signed up for an account at Alpaca. I have a significant amount of experience with both trading accounts and forex software systems (“forex bots”). More than anything else, I was looking for a trading account that offered commission free trades. I have had trading accounts with practically every major broker-dealer over the past ten years. Many of these accounts charge a minimum of $9.99 per trade. When you trade as often as I do, often executing several trades a day, the commissions really start to eat into your gains. I also did not want an account that required that I maintain any minimum balance or execute a certain number of trades since my investments are diversified and there are periods where I am traveling and therefore do not execute as many trades. Secondly, I was looking for an account that offered an HTTP API client. For those with less technical experience, Alpaca is still relatively simple to use. In other words, there is no reason you could not figure out how to utilize the API on your own. However, if you find yourself needing additional assistance, the customer service at Alpaca is very helpful and responsive. I will note that I was a bit concerned that Alpaca offered no telephone-based customer service options. Nonetheless, I figured I would give it a try. I have been pleasantly surprised by how quickly customer support has responded to the few questions I have had (mostly about setting up the API). In a way, electronic communication has been more simple and efficient than say, having to follow a dozen prompts just to talk to a live customer support agent, a problem I have run into in the past in dealing with some of the larger brokers. Back to the technical stuff though — I have experience using Metatrader. Metatrader is trading software that is used by many brokers. The program is effective and easy to use since there are many trading features already incorporated into the software. But for those, like me, that want to take advantage of other features not offered in a program like Metatrader (such as portfolio optimization), you need an API (Application Programming Interface). An API is, for those of you that might not know, essentially a program that allows two applications to communicate. Alpaca utilizes a REST (Representational State Transfer) API. In plain terms, it consists of a set of rules that allow you to access data. Alpaca’s trading system allows you to utilize some of the most widely used (and successful) trading strategies. Some examples include Time-Series Momentum/Mean Reversion, Cross Sectional Momentum/Mean Reversion, Dollar Cost Averaging, Market Making and Day Trading Automation. I have found that automating the day trading process has dramatically improved my trading results, saving me a significant amount of time since it is no longer necessary to constantly check market conditions and make trading decisions. So while you don’t need to be an expert on computer coding or even understand all of the intricacies of APIs, you do need to be able to write your own program to place trades with Alpaca. Alpaca supports pretty much any language, including Python, C#, Go and other languages. I was able to incorporate my program fairly easily. In the event that you do not understand coding, there are plenty of resources on the web that can provide some guidance. In the alternative, anyone that understands basic coding could put together the program for your use. Don’t let a lack of technical experience and knowledge keep you from signing up with Alpaca. 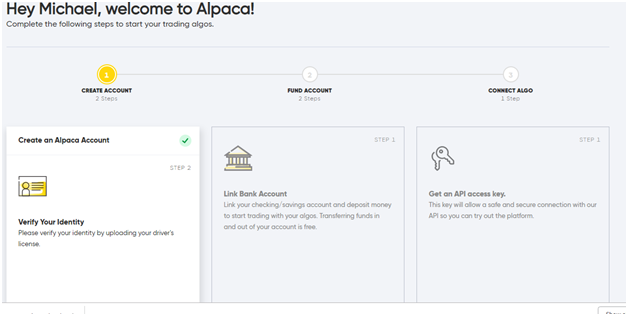 There are simply too many advantages to utilizing Alpaca’s trading platform. As for opening the actual account, the process was very easy. You simply click “Sign Up” on Alpaca’s homepage. You will then be prompted to enter your email address and create a password. Following that you will be required to enter your contact and personal information, basically everything you would expect to provide when signing up for a broker account. It is worth noting here that Alpaca is a member of the Financial Industry Regulatory Authority, Inc. (FINRA) and the SIPC which insures your securities up to a value of $500,000. Once you have completed your application you are taken to a confirmation screen which advises you that your application is under review and that once approved you will be able to fund your account. (See a screenshot of the confirmation screen above). I found the verification process to move very quickly. In fact, the following day I received a message that my application had been approved and that my account had been set-up. I was able to quickly fund my account and after a few hours spent getting my program into the API, I was up and running. Trading is extremely easy on Alpaca. I have been able to implement more advanced orders than on traditional trading platforms, such as trailing stops and conditional orders. Again, the implementation of automated strategies has been life changing. Not only have my trading results significantly improved but it has saved me countless hours, inherent in any manual trading system. With my free time I am now able to spend more time reading up on the markets which allows me to implement strategies in other areas of the market, such as in the cryptocurrency sector. And just as advertised, there are absolutely zero commissions. After several months of trading on Alpaca’s platform, I have saved well over $1,000 in just commissions alone. Alpaca promises to introduce Premium Plan subscriptions in the future where “premium users will have access to various perks, such as higher quality live data feed and more computing resources”. I for one am excited about even more features to further increase my profits. But in the meantime, I will continue to enjoy completely free trading on what I have found to be the best trading platform that I have ever used. I plan to be a loyal Alpaca user for many years to come.